I have been a big fan of the MUJI acrylic drawers look for awhile and had asked for the 5 drawer case for Christmas. My dear boyfriend obliged, and I was so excited to organize my favourite make-up products. I find it so easy to get ready in the morning. The five drawers roughly equate to the five stages of my make-up routine. As the MUJI acrylic drawers are quite popular, I thought I would share how I organize mine and a bit of a review at the end, especially if you are currently in the 5 drawer vs. 3 drawer vs. 2 drawer debate. Plus, though it's not all of my make-up, this is a good indicator of what I have in my make-up collection and who doesn't love seeing a make-up collection? So get ready for this storage, review, collection, favourites....all in one. P.S. 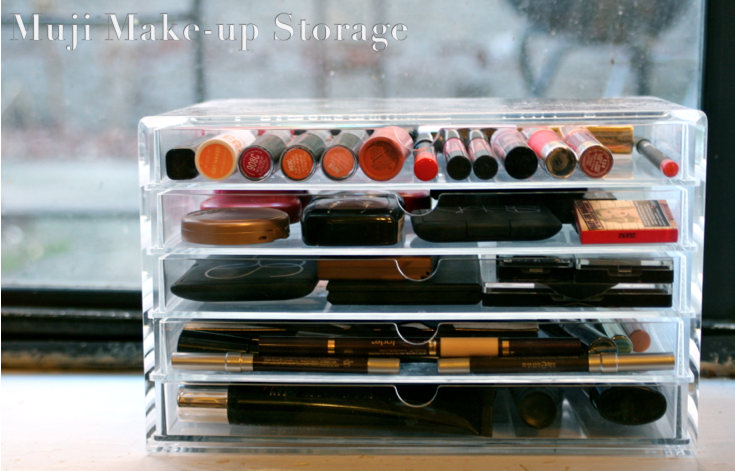 I have an updated post on my MUJI make-up storage here! For the bottom drawer, I put in some of my favourite current face products, and samples I don't want to forget! Face and eye primers from Urban Decay, Nars, and OC8; Wet n Wild Coverall Foundation and Nars Radiant Creamy Concealer. I also put in some highlighters- Victoria's Secret Brightening Gel Cream and Wet n Wild Reserve your Cabana. 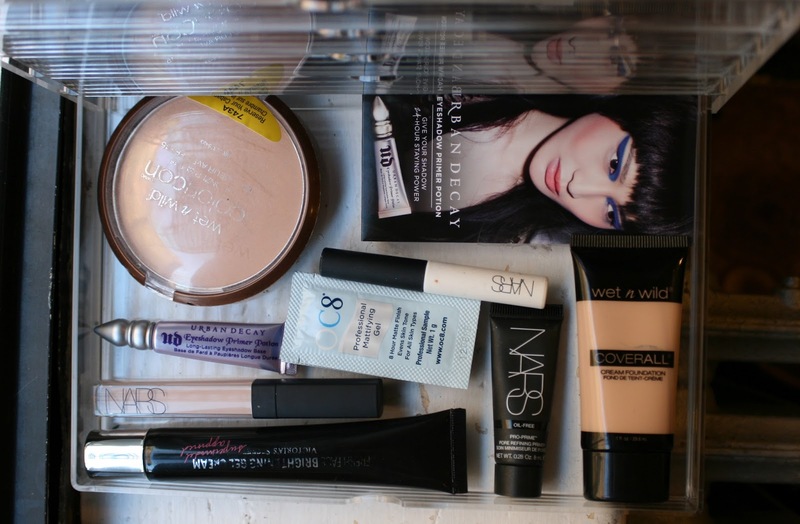 I use the VS Brightening Gel before I apply my foundation, so it's perfect for this drawer. The Wet 'n Wild highlighter isn't step one, but its large size made this drawer the second best option. 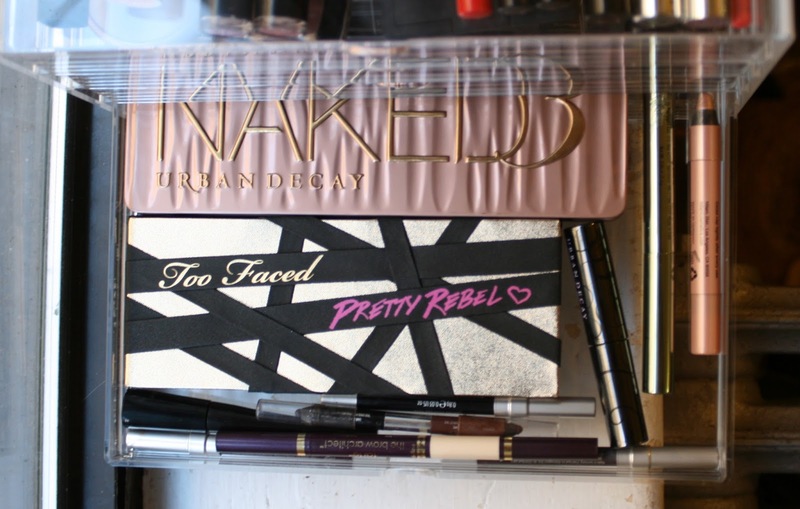 In the next drawer up, I am storing a couple of my most recent eyeshadow palettes, UD Naked 3 and Too Faced Pretty Rebel. Having them here makes sure they are front and center, so I experiment with some new shades. Also in this drawer, I have my Tarte Brow Architect pencil, some of my favourite Urban Decay 24/7 liners, and Elf Liquid Liner. Along the side is my current mascara-UD Supercurl and a couple of cream eyeshadows-Mally Smokey Quartz and Milani Toasted Champagne. Basically, all the eye essentials. Eyeshadows are my favourite make-up item, so of course I had to dedicate a second drawer to it. In here I have some of my essential palettes. Nars The Happening, UD Naked Basics, Sleek Storm, and a selection of Wet 'n Wild shadows. Wet 'n Wild Panther is a must-have for me- I use it to set my liquid liner. This drawer is all about the cheeks. Some of my favourites from Tarte and NYX; Nars Sin, Sleek Contour Kits, Sonia Kashuk Kiss on the Cheek Palette, and a couple of the Balm samples in Mary Lou Manizer and Hot Mama. This is so close to all my blushes, but if the collection does grow anymore it would be easy to switch out shades for recent purchases or based on the seasons. 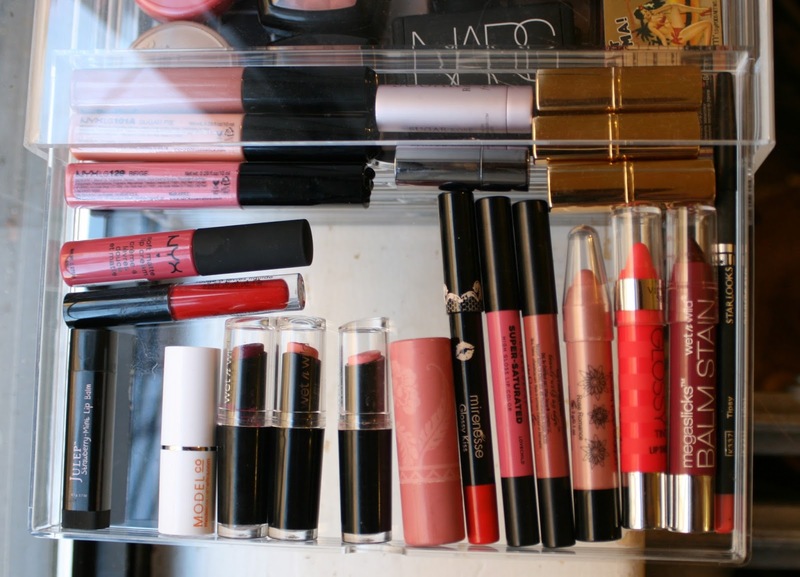 And finally the top drawer, and last step of my make-up routine, lip products. I am not much of a "lip junkie," so I was quite surprised I managed to fill this drawer (while still having lip products in my purse, in my drawer, on my nightstand...) Included are Julep, Wet n Wild, Urban Decay, NYX, Tarte, and some various brands from beauty boxes. I am so happy with this set-up for my make-up. It sits right at the corner of my desk and looks gorgeous. I store my brushes on top, in these DIY glass containers, making the everyday routine all in one place. If you have a smaller collection it might be the perfect option for storage. And if your collection is larger, it's perfect for bringing favourites and recent purchases to the forefront. I made several trips to MUJI to decide between the 5 drawer or two 2 or 3 drawers, as I have seen a lot of people stacking the 2 and 3 drawers on top. 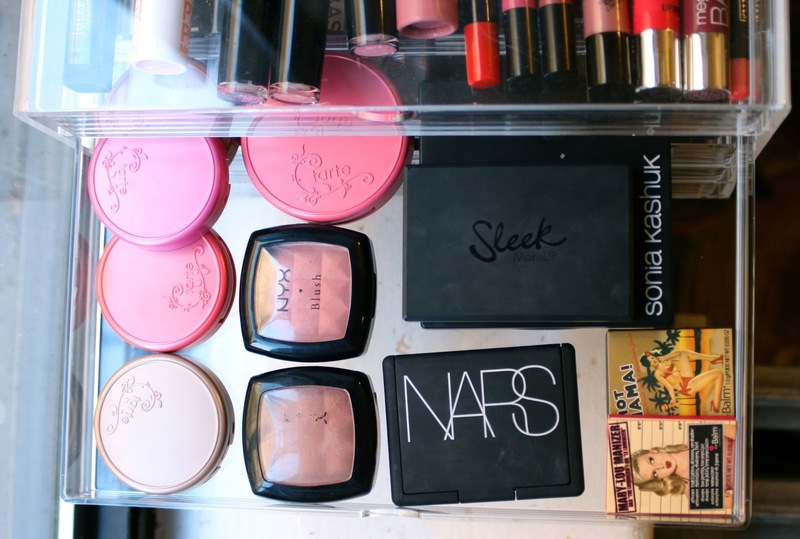 I find the 5 drawer to be the perfect depth for beauty products. No wasted space or difficulty finding things as most items fit perfectly in one layer. Some thinner palettes and blushes can be stacked to fit more, but not so much that things get hidden. Everything is easy to see and accessible. The 5 drawer case retails for around $25 making it very affordable as well. Buying a 2 drawer and a 3 drawer basically doubles the price as both are a bit over $20 each). The quality is excellent. I have an acrylic rack for my nail polish storage and this drawer makes it seem super flimsy (not a good thing for my nail polish but a good indicator for the quality of MUJI). Overall, I am a big fan, and I only wish I had gotten this sooner! Ooooh, these drawers look wonderful! I like how they're completely clear too, so you can see inside. I store my makeup in a slightly organized chaos. I would like these, but I'm not sure if I have any more room.